The Gloucestershire Warwickshire Railway’s opening of the long-awaited northern extension to Broadway has not only reaped rich dividends for the heritage line, but it has generated an extra major income stream for the Yellowstone tourist honeypot. 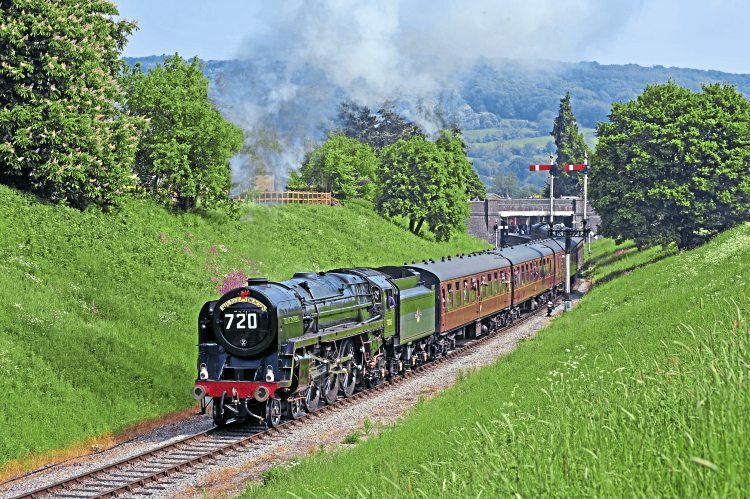 Robin Jones visited the landmark Give My Regards To Broadway spring bank holiday Cotswold Festival of Steam. The impact of a heritage railway going from ‘somewhere to somewhere’ has rarely been more forcefully underlined than at the Gloucestershire Warwickshire Railway in recent weeks. The late May bank holiday Cotswold Festival of Steam, the line’s first gala since the opening of its extension to Broadway on Good Friday, March 30, and sponsored by Heritage Railway publisher Mortons Media Group Ltd, attracted 35 short of 6000 fare-paying passengers over the star-studded May 25-27 event. It featured Didcot’s ‘Blue King’, GWR 4-6-0 No. 6023 King Edward II fresh from its Severn Valley Railway adventures, Britannia Pacific No. 70013 Oliver Cromwell from the Great Central Railway, working out the last few months of its current boiler ticket on heritage lines, USATC S160 2-8-0 No. 5197 from the Churnet Valley Railway and Hugh Shipton’s GWR 0-6-0PT No. 6430 from the Llangollen Railway. But it was not just the hugely-successful festival – which saw passenger numbers soar by 66% compared to last year’s corresponding event – that has sent attendances at the line soaring through the roof, placing it firmly in the Premier League of Britain’s heritage railways. the race trains, fish and chip specials and driving courses. Also, this year the season opened a week later than in 2017. Spokesman Ian Crowder said: “The figures overall have been astonishing and have taken the G/WR by surprise – while we expected a big uplift in passenger numbers, to have achieved this kind of endorsement of all the hard work that has gone into extending the line to Broadway is, to say the least, very gratifying.